Ficus Benjamina thrives in my country Vietnam, especially in the north with tropical climate. People grow the tree in bonsai gardens, balcony pots, hotel lobbies, and house yards, or sometimes even grow freely next to countryside roads. Benjamina was also my first tree, which I bought from a local street market at about USD 5. It was a pre-bonsai plant. Also at that time, I also picked a few another seedlings of ficus, just to learn how to grow a bonsai tree from little plant. Like other ficus bonsai trees, Benjamina trees flourish in my region thanks to favorable tropical climate. Temperate fluctuates from 30-38 degree Celsius in summer and 10-18 degree in winter. The other seasons of cool autumn and warm spring, temperature and light is so good for botanical growth as well as propagation. Though it so popular in my region, it costs around USD 50-100 to buy a well-trained tree with aged-looking trunk, aerial root, twiggy branches, and dense canopy. A real aged well taken care tree was rumored to be bargained at a record price of millions US dollars, though it wasn’t sold at all. Bonsai Clubs International (BCI) published an article about the tree named “mâm xôi con gà” on BCI Magazine in March 2012. Ficus trees are suitable for root-over-rock styles. Specially, due to hydroponic characteristics, in my place, Ficus on rock can be dipped in a water-filled tray without using soil at all (see above picture). 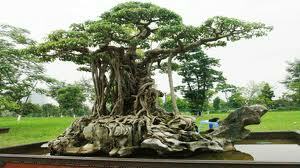 Despite the species’ popularity, some online sources warn that this type of ficus is mostly suitable to place around altar or holy areas, and that Chinese do not grow the species indoors as they are afraid of alluring ghosts to inhabit in the trees. Though the rumor has not been verified, frankly it startled me a little. I don’t know whether in Western world bonsai lovers believe the same. If you do, please share your comment here.